Wall paintings had existed since the earliest history of mankind. Pictorial text on cave walls and on the pillars of ancient civilizations eventually morphed into text characters of some of the most commonly used languages today such as the Chinese and Indian languages. As such, we can see that pictures and paintings are fundamental and essential parts of human development that serve to communicate ideas and messages. Graffiti and wall paintings appear to be more intricate than simple pictorial texts. They serve more than just putting simple ideas across to those who come in contact with them. They are more symbolic, and as in art pieces, are subject to individual interpretation. Some even serve to create an illusion to passers-by to stimulate their perceptions of the world. If you don’t really get what I mean, check out the following graffiti, wall paintings and murals found in the Net. Note the emotions you’ll experience and the thoughts that would run through your mind. You will then see how easily we humans can be affected by imagery effects. An artistic painting on the back of a house with gradients of yellow and red. If you look closely, you would see meshed up images of birds seemingly flying across a window. Sci-fi wall painting resembles that of movie posters of the 60’s and 70’s. The trademark Gollum, aka Smeagol, from the Lord of the Rings trilogy. Seems like he’s still searching for his precious. Swarm of red, orange and green minnions. Taken near Sunday Market in Oslo. A modern take on Victorian era art. Complex and alluring mural mixing various elements and figures into one great painting. A sneak peak of what goes on in an otherwise ordinary-looking house. Does this tunnel exists, or is it just a wall painting? Pulling the ‘dog’ out of him? Four mismatched musicians. One wonders what kind of music would they produce? With this guardian by the door, anyone would be safe in here. Playing tricks with your eyes. Events of our lives appearing like channels on our TVs. Perfect view of the sea… but no sea breeze. Opps. Error loading wall painting. Even if nothing really happens at the back of the house, you can always make it seem lively with paintings of social activities. Don’t walk into the wall. Cute little cartoon figures drawn by graffiti artists of Venice, California. Beautiful painting portraying mankind’s desire to soar in the skies. An ad from Unicef — "Send a postcard. Address the problem. Buying a single set of UNICEF postcards provides 26 children with the necessary child paralysis vaccine. This Christmas, your good wishes may save lives." A new and refreshing take on American Gothic. Nike graffiti with soccer balls drawn embedded within the wall. Cool and smooth graffiti found in Hasselt, Belgium. A giant bee to scare away the apiphobics. The young girl with a cheeky smile and the red streaks behind her paint an atmosphere that is a little disturbing. Who needs an actual scenery when you can beautifully paint it against the back of any building? 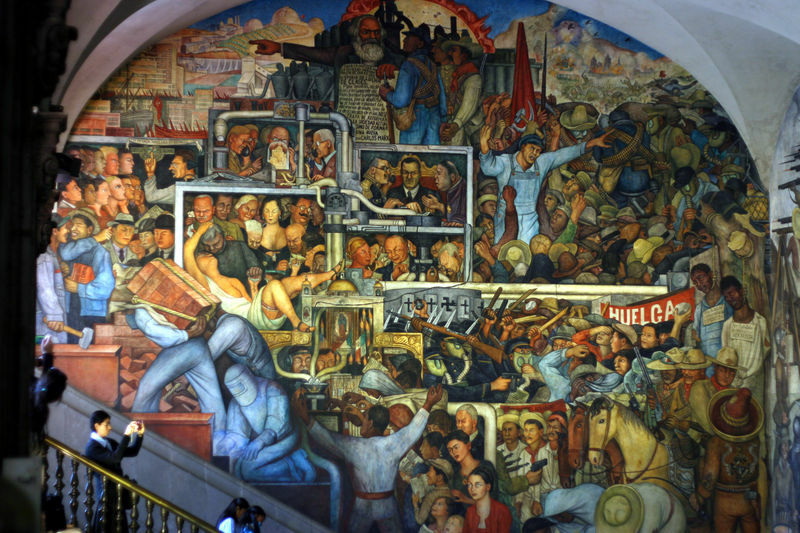 Complexity in a mural is an attraction for tourists. I can’t help but feel a surge of hope within me when I look at this mural. Beautifully painted and expressed. Did you realize that the whole thing is a painting painted against a flat surface? The post 30 Extraordinary Graffiti and Wall Paintings appeared first on Hongkiat.